Stop me if you’ve heard this story before: A mobile game studio toils in obscurity for several years creating apps that no one seems to care about, and then one day it introduces its new project to the world… and it becomes an instant hit. That description could be applied to Rovio’s Angry Birds and OMGPOP’s Draw Something. And it could also be applied to QuizUp, the hot new game from Icelandic game studio Plain Vanilla, which recently added a top-shelf investor, Sequoia, as part of a $2 million extension to its Series A round of funding. For those not familiar, QuizUp is the hottest new mobile game out there. Since being launched on November 7, the game has signed up more than 1.5 million users, who have played more than 70 million matches over the past 10 days. As a result, QuizUp has spent the past week in the #1 spot on the Apple App Store, and it’s received rave reviews from users, with a 4.5 star rating over more than 4,500 reviews. Not surprisingly, users are highly engaged, spending 40 minutes a day on average in the app. But Plain Vanilla isn’t new to the whole mobile app scene — it’s been around for the last three years, originally releasing a game for pre-schoolers called The Moogies. Once that game launched it was highlighted in the App Store, but as my colleague Greg Kumparak reported, once the App Store moved on it failed to generate any new interest, and Plain Vanilla was forced to either raise money or shut down. So the team went to Silicon Valley, raised a $1 million seed round, and began development on a new product. CEO Thor Fridriksson told me in an interview that at that time — about a year and a half ago — the company was focused on building a platform that would be a hybrid between quiz games and a social network. Now back in Iceland, Plain Vanilla hired the staff it needed to get that project off the ground. After building a few individual subject-oriented “QuizUps,” the company hit paydirt by partnering with Lionsgate to create a branded quiz game for fans of the Twilight film series. Riding on the Twilight brand, that app became hugely successful with young teens and others who are too into sparkly vampires, but it put Plain Vanilla on the map. So the team came back to Silicon Valley and raised another $2.4 million from investors that include Greycroft Partners, IDG Ventures, Tencent, BOLDstart Ventures, CrunchFund, and MESA+. Armed with that cash, Plain Vanilla was ready to begin work on its most ambitious project yet, which would use the same game mechanics as Twilight QuizUp, but would allow users to compete against anyone virtually in trivia matches about virtually anything. Like Draw Something before it, QuizUp is all about two-person, asynchronous multiplayer competition. While users can challenge complete strangers in real-time, the more interesting game dynamic comes when you challenge another player who may not be online at the same time. You answer a series of trivia questions, and are awarded points based on whether they’re correct and how quickly you answer them. And, when the person you challenge shows up, they are given points based on the same scale. 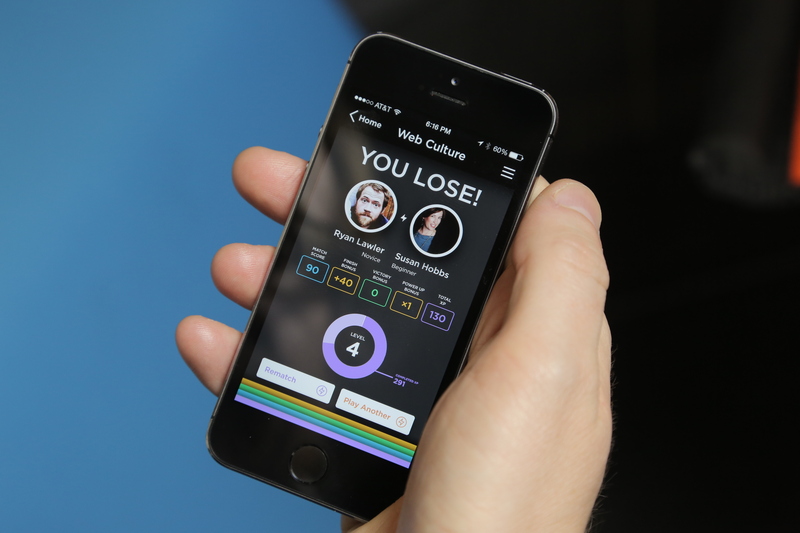 The whole thing allows users to build trivia matches whenever one or both players has time, making trivia gaming snackable for the first time. It also enabled users with various interests and areas of expertise to compete. With about 300 different categories and 200,000 questions, it caters to virtually any trivia fan, which is probably one of the reasons that it grew so quickly. It’s always interesting to watch a mobile app team catch lightning in a bottle, but there was some evidence that it would do well even before it made it to the Apple App Store. While still in beta, Plain Vanilla began to see a number of so-called Silicon Valley influencers using the app — including what seemed like the entire Sequoia Capital partnership. Sequoia ended up calling Plain Vanilla a week before launch and offering to invest, leading a $2 million extension of its Series A round. Also in that round was e.Ventures, led by co-founder and managing partner Mathias Schilling. For Sequoia, Fridriksson and company worked with Roelof Botha, who has become famous for his ability to pick social network winners like YouTube, Tumblr, and Instagram. Paperwork was quickly filed, and the company was wired the money on the day of launch, not knowing what to expect from users. Getting Botha interested was a major coup for the startup — “He’s a big trivia lover and one of the smartest guys I’ve met,” Fridriksson told me — but the company had no idea that a few days later it would find itself at the top of the App Store charts. “We looked at this as a risk mitigation thing,” Fridriksson said. In retrospect, if it had just waited a week or more, it might have been able to raise a lot more money, or on better terms. That said, the company isn’t too worried about that right now. Instead, it’s more concerned with keeping its servers running and hiring more employees to build out the product. Today it has 20 employees, most of which are still in Iceland — although the company still has sales and business development offices in New York City and San Francisco. But it’s looking to add a few more folks, thanks to its new funding and newfound success.